A tough and great value plastic drinks bottle with screw top. Comes in 0.5, 1 and 1.5 litre sizes. Very lightweight drinks bottle fitted with a push/pull nozzle for ease of use while on the move. Made from light alloy, the bottle has a 0.75 litre capacity and comes in two colours, black or blue. Fits into a standard bike bottle carrier and is completely leak proof. 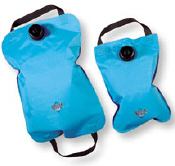 Lightweight and virtually indestructible roll up water carriers, with carry handles. They come in 2, 4 and 10 litre sizes. The larger size is ideal for camping. The Platypus Breakaway Plus weighs in at just 210g and features padded contoured shoulder straps and an insulated construction to keep drinks cooler for longer. The reservoir holds 2 litres, fed to the mouth via a plastic tube. Wear it on your back, or in a rucksack. The Source Bottler features a tough, flexible and leak proof Durabag inner bladder with a PU insulator to help keep drinks cool or prevent them from freezing in extreme conditions. The push/pull cap gives quick access to drinks. Capacity: 1.5 litres. The Source Clear is a tough, taste free bladder that will fit into a day sack or rucksack to give hands free drinking via a plastic tube that can be clipped to a shoulder strap for convenience. It holds 2 litres of liquid. SIGG Drinks Bottles are the market leader and first choice for both outdoor and sports enthusiasts, used the world over and valued for their toughness. Made from a single piece of aluminium, they combine strength and hygiene with lightweight. 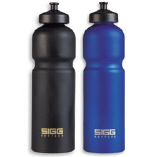 All SIGG drinks bottles have a special interior coating which alleviates odours or contamination of the contents. The SIGG interior coating is resistant to fruit juices and acids, alchohol and isotonic drinks. They will fit in most rucksack pockets or bike bottle holders and come in 0.6, 1 and 1.5 litre sizes in various colours. Versatile fluid reservoirs made in a durable welded three ply plastic laminate, designed not to adversely impair the flavour of liquids. Hosers come complete with the Platypus drinking tube and the latest Hyperflow Bite Valve, enabling any pack, waist belt or even pocket to become a hands free hydration unit. The range offers a variety of sizes. A very flexible hydration bag which will stand up to being frozen and boiled. It rolls or folds up for packing in tight places. Made of a multi-laminate barrier plastic, the Flexi Flask will hold liquids hot or cold without imparting any unpleasant tastes. Excellent value tough, long lasting plastic bottle with a plug and screw top attached to the bottle so you won't ever lose it. The one litre capacity is ideal for a day on the hills. This is all the bottle you really need and you can't go wrong at just two quid. Price £7.99 Made from tough plastic, the Nalgene bottle has a wide mouth, ideal when you are really thirsty and need to gulp water down, and a strap attaching the top to the bottle. It fits easily into rucksack pockets and comes complete with graduated sides for measuring, handy if you're camping and need to measure water for cooking.